If you are a new mother, are browsing Netflix and hit upon “The Let Down,” you might think, “No, thanks, I know this story too well. Am I not going through it all now?” But this feeling will leave you and never revisit if you spend 3 minutes watching the dramedy. I promise you, you will binge-watch the episodes, even if you have to feed, change and put your baby to sleep in between five times over. This series sets the mood for comedy right from the first moment and carries it through consistently across all the episodes. The timing is impeccable and none of the episodes lose the intensity ever; it is a perfectly conceptualized and meticulously scripted piece of Australian TV. Alison Bell as Audrey is superb and lovely with matchless expressions. Indian motherhoods may be somewhat different from what Audrey goes through, thanks to moms, moms-in-law and daayis who could help. Pregnancy, childbirth and postpartum in India is dotted by someone to cook for you, clean, massage the baby, bathe the baby, bathe you and so on. But if you are an urbanite and would like to take care of your baby on your own, then “The Let Down” is a must-watch. Many women today detest the interference of moms or in-laws; they are slowly moving towards a western model, wherein you rely on science to learn the laws of motherhood, not on other people. You also learn to use technology in your favour. Oh, the gadgets out there today! From a baby heart monitor for your peace of mind to the breast pump that is an absolute essential for working mothers. I just saw the ad for a new crib that moves gently and rocks your baby back to sleep while locking the baby in a specific position during sleep. 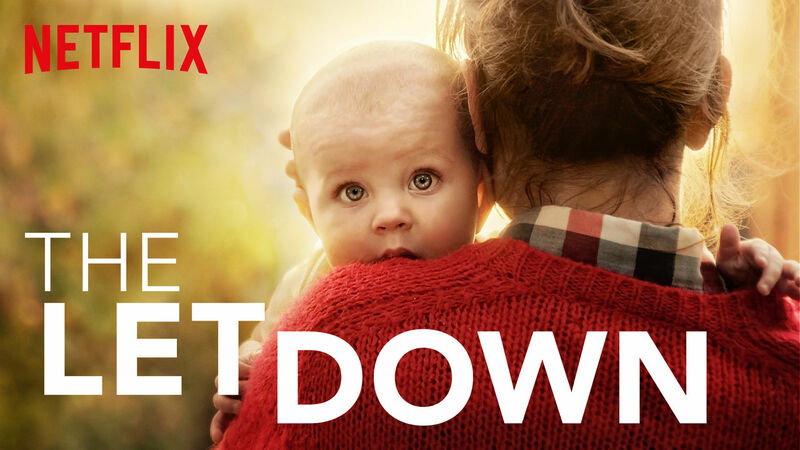 “The Let Down” introduces, explains and takes you through the hard truths of motherhood when you are trying to independently bring up your baby, which is kind of, the norm in the West. But even in India, if your MIL is uncooperative or your mother is toxic or, god bless her, dead, you would end up quite like a new mother in the West who takes the help of others or support groups. Support groups for birthing, breast-feeding, you name it—that’s on, today. But new motherhood is so traumatic, the first few months especially, you wonder if you could actually drive yourself out to the support group without doing 25 different chores as prep for it. Put your baby into the car or pram or hold or wake the baby, pack formula if you need to do that---all of which are good reasons for another unending bout of crying—the reason for which is: unknown. In fact, you will find that one of the most relaxing realizations in all your motherhood is that babies at 2 months cry—for no reason at all—you may hold them, change them, feed them, but don’t expect the crying to stop. It need not. One such realization for Audrey is that light creeping in, during the night could harm the baby’s adjustment to a night time sleep routine. She fills the cracks in her windows after reading about it. She also realizes she has the ability to sleep for 3 seconds at a time! Sleeplessness in new parents cannot be commented upon enough really—except as inevitable! Which is indeed the starting point of “The Let Down.” It is not that Audrey detests her baby for half a second. She does not, she just cannot understand the lack of understanding her friends, occasionally her husband and her mother offer her in different ways. Clearly, the world is divided into—those who are new parents and those who are not. In fact, Audrey forgets all her troubles when she sees the sweet baby she holds in her arms. Is there anything more beautiful, really? Audrey’s troubles which could be termed postpartum depression of a sort is completely a result of her situation—being stuck at home, being stuck with the baby’s routines at all times without a break, friends not understanding her plight and so on. Though the show does not term her condition as depression, this, it appears can be cured with one simple thing from others—support. The series traces the life of her friends in her support group, each with a small story to tell and funniest is the man in the group who has quit his job to take care of the baby. At one point, he attends an interview for a job and cannot talk about anything other than his baby---this is so well done and true to life—it could take your breath away! Isn’t this why many women find it hard to get back to work—many don’t return at all! The series is made memorable by the scenes where Audrey cries sitting in a bus with her baby, betrayed by her friends, or when she realizes that a brain pruning is occurring just then and she loses most of her words. We are going to be more intelligent, it will all come back but, for now we are only monosyllabic, nothing more…New mothers cannot relate to this situation of utter horror any differently. The show is very current and contemporary too---Audrey’s husband cannot change the baby's diapers in the men’s toilet--this patriarchal set-up (in the toilet, that is) that assumes only women are care-takers of babies was changed by Obama in the USA only recently, other countries are yet to catch up! From the awkwardness experienced by others when new mothers feed babies in public and the importance of buying the right kind of pram—"The Let Down” touches on numerous new parenthood topics with the perfect amount zest and quirk. It is laughs all the way, yes, but none that are cheap or silly. By the way, the title is derived from the moment when breast milk kind of rushes out—often more embarrassing a situation than the lucky one it is actually supposed to be. After all, breastmilk saves the lives of children until they can consume solid foods at month 4 or 6. The effort is quite laudatory in this series mainly because it retains a simplicity that hides the hard work of capturing early motherhood realistically. Quick twists and plot turns that all remain truthful to all the traumas of early motherhood without an ounce of sugar-coating cannot have been necessarily easy—no matter how many anecdotes you came across! Add to this the fact that people forget the trauma of early parenthood too quickly because they still have little monsters at home who have progressed in devising ways to traumatize their parents! Never losing sight of the main issue of early parenthood even when it visits multiple sub-plots and dramatic asides, the portrayal of all drama is extraordinarily on dot here. This show could be a good learning exercise for many of us, pacifiers, car seats, cribs, strollers, better nanny services—get the lingo right first! It resonates with every mother/carer, has very identifiable issues and is a quick watch. The truth is, nobody gets motherhood or parenthood all right, many only pretend to. No wonder the motherhood drama takes over at some point or another detailing all the sacrifices moms made, one by one over the many years of children's growth. But for this version of the drama, one could visit any household, any day, in India, of course. Perhaps all of it is rooted in the early stages of the baby, who does not sleep like a baby yet, and the helplessness, lack of support and understanding from others makes it the worst time of one’s life. India needs to watch this, Indian men, especially so. So that instead of staring at pregnant women nutsy, and being told off by MIL that this is “the women’s thing,” they could learn a thing or two about early motherhood/parenthood and kick the embarrassment out. This piece was published in Women's Web on May 18th 2018. Jhally, Sut, 1998, Edward Said: On Orientalism. Northampton, MA : Media Education Foundation. ABSTRACT: The film discusses Edward W. Said’s work. His hypothesis in his book Orientalism is re-presented along with his take on a variety of contemporary issues of cultural, historical and global importance. "On Orientalism" mainly takes the form of an interview with Edward W. Said on Orientalism, his 1978 book and his latest thoughts on the subject. Sut Jhally of University of Massachusetts, Amherst introduces the film and also chips in, now and then, to tell us a little bit about Said’s work. He begins by telling us that Orientalism created new fields of study such as postcolonial theory and informs us that Said’s concern is to answer the following questions: “Why is it that when we think of the Middle East, we have pre-conceived notions? And how do we understand those different from us?” The film has several sections, titled The Repertory of Orientalism, Orientalism and Empire, American Orientalism, Orientalism Today: The Demonization of Islam in the News and Popular Culture, Orientalism in Action: The Media and the Oklahoma City Bombing, Orientalism and the Palestinian Question. Said begins with the basics by telling us that there is a lens through which the West looks at the Middle East and distorts the actual reality of the people; “It is motivated.” The lens used, Said calls Orientalism. In response to the interview questions, Said replies in a personalized manner which makes the film interesting for a lot people who have read Said but haven’t interacted directly with him. In response to a question about what triggered his interest in Orientalism, he mentions two things. One, he says, had to do with the Arab-Israeli war of 1973, when the media showed the Israelis as cowardly and not modern, while they fought like anybody else! Secondly, he says, the disparity between his experiences of what being an Arab was, and representations of that, drove him to decide to write a history. Said then gives us concrete examples of Orientalism—of the repertoire of images, wherein the Middle East is full of sensual woman, monsters and secrets—all of which, he says, have nothing to do with the real Orient, but were simply narratives consistent with themselves. Such narratives, he emphasizes, extended to descriptions by experts and were presented as objective knowledge. According to Said, the images produced by artists and novelists of great repute like Gerard de Nerval and Edward W. Lane conveyed that the Orientals were all the same: that the Orient doesn’t develop; is outside of history, is placid, timeless, still and eternal. He says that all this is simply contradicted by the fact of history and had merely lent to the creation of an ideal other for Europe. Said then speaks of different kinds of Orientalism and says that the difference consists in the difference between the relationships with what gets called the Orient. He identifies Britain and France (European Orientalism) and the United States (American Orientalism) as involved in the two main kinds of Orientalism, direct in the case of Britain and France and indirect in the American one. The “new American Orientalism” that this film discusses is refreshing and provides Said’s take on a variety of issues. The film shows us clips from movies, press conferences, news coverage and even cartoons to prove its point, all of which make this the film very watchable. An animation clip from Aladdin has him say, “It’s barbaric, but hey, its home,” and so no one can miss the point being made. Said continues by saying that in movies the Arabs are always villains and fanatics and the dead Muslim bodies are huge in number. He says that the movies present the idea that Islam needs to be stamped out and that the only language Islam understands is violence. Said’s response to terrorism in this film appears balanced; he says, “there are terrorists as there are, everywhere,” and that “in not really mounting a serious critique of all this, the Arabs, according to him, have participated and allowed the misrepresentations.” The 22 Arab countries together don’t have an information policy to try to give a different picture of the Arab countries to the West, we are told. Although being very crisply edited, timely and useful, with music that usefully underlines the film-text, the film doesn’t take up critiques of Orientalism. Hence it needs to be seen as an introductory film, helping students to grasp the hypothesis of Orientalism. The film doesn’t tell us why a lot of people stopped reading Said at Orientalism, seeing his other work as repetitive and uninteresting. Said’s thesis relies on certain readings of Foucault (power-knowledge thesis) and Gramsci a bit too much, and describing all of history as a quest for power has left a lot of history unexplained. Alternate understandings of Foucault like that given by the editor Arnold I. Davidson coupled with Said’s thesis could lead us to far more interesting conclusions, but they have simply remained unexplored both in this film and otherwise as well. Moreover, Said’s thesis has in actuality resulted more in conspiracy theories than anything else. In conjunction with ideas like hybridity that postcolonial scholars like Bhabha have proposed, Orientalism remains just an interesting thesis that doesn’t actually produce more questions or research problems. With scholars like Spivak deeming all theoretical knowledge as running counter to the anti-Orientalist agenda, the future of these areas of study simply looks bleak. The followers of Said waver between positions that are anti-theory and at the same seeking subaltern voices. Neither epistemology nor politics has indeed benefited from the thesis of Orientalism. The thesis of Orientalism prompts us to say that most statements that were expressed about the ‘other’ were purposefully racist and derogatory; that the purpose here was power, power to rule and administrate the other. However a careful look at history will show that such statements have persisted in Western travelers’ accounts from the 15th century on and these travelers and visitors had no intention to rule or conquer. This has been easy to prove, at least in the case of India. In short, the situation has been one where evolving a criteria to understand current Orientalisms is not progressing at all. The only significant line of thought in recent scholarship that is helpful in this situation is to be found in S. N. Balagangadhara’s work. “How is it a contribution to knowledge, to say that the Europeans were prejudiced against the East, without explaining why they had to necessarily be so?” asks Prof. Balu. Balagangadhara also asks that if Orientalism consisted in wrong representations, then we must be able to come up with a correct understanding of the East, to which postcolonial scholars give meek replies about the evils of essentialism and the quests for origins. Such dead-ends and problems, however, don’t seem to be within the intentional purview of the film. In this sense, the film is somewhat adulatory of Said. But it should be very useful for beginners, students of Cultural Studies, Postcolonial Theory, Gender Studies, Cultural and Social Anthropology and related disciplines. Balagangadhara, S. N. Lecture titled “Cultural Difference” at Centre for the Study of Culture and Society (CSCS), Bangalore, Feb 10th 2010. Balagangadhara, S.N and Marianne Keppens. 2009. "Reconceptualizing the Postcolonial Project: Beyond the Strictures and Structures of Orientalism." Interventions 11 (1): 50–68. Foucault, Michel. 2004. Abnormal: Lectures at the Collège de France, 1974-1975. A. I. Davidson, ed. New York: Picador. Spivak, Gayatri Chakravorty. 1990. The Post-Colonial Critic: Interviews, Strategies, Dialogues. Sarah Harasym, ed. London: Routledge. Kannan, Sushumna. 2010 Review of Edward Said: On Orientalism. Anthropology Review Database. April 30. Electronic document, http://wings.buffalo.edu/ARD/cgi/showme.cgi?keycode=3529, accessed May 9, 2010. 2007 The Dhamma Brothers. Oley, Pennsylvania: Bullfrog Films. Notes: VHS / DVD color 76 mins. Criminals - Rehabilitation, Vipasyana (Buddhism), Dharma (Buddhism), Prisoners - psychology - Alabama, Buddhism - Alabama, Meditation - methods - Alabama, Prisons - Alabama, Donaldson Correctional Facility (Bessemer, Ala.), Donaldson Correctional Facility, Documentary films. ABSTRACT: This film documents the effects of Vipassana, an ancient Buddhist meditation technique, as it is introduced to a high-security prison in Alabama, following four prisoners in detail and the growing brotherly feeling among the community. The word for 'Enlightenment' in the Asian traditions is "mukti" or "moksha" which means freedom or liberation. If you thought taking a meditation technique that aims at such an enlightenment to prisoners in jails was a bit too literal, you would be wrong. For, the film The Dhamma Brothers captures brave attempts by the prisoners that even the unimprisoned would find difficult to carry out. In The Dhamma Brothers, Jenny Phillips, a cultural anthropologist and psychotherapist, tells us of the significant change in prison inmates brought about by Vipassana meditation. These include a special feeling of brotherhood, love and compassion: a feeling that actually spread among people both within and outside the prison. Philips focuses on four of the practicing prisoners and interviews their families, friends, and the administrators at the W E Donaldson Correctional. The film captures not just the pain of being restricted and cut off from society but also the specific traumas of life behind bars. A prison administrator points out that there is organized crime within the prison and an inmate confesses that he perceived the prison as an hostile environment, "I felt like I had to have this image [of the officers] if I wanted to survive here." The practice of Vipassana has resulted in an attempt to "rise above prison culture" and deal with the stressful life inside prison. Vipassana is a meditation technique the Buddha gave to the world 2500 years ago; it originated in India and means "insight" or "to see things as they really are." Vipassana is taught around the world using the format developed by S. N. Goenka and teachers trained under him. It is a 10-day course that involves preparation through observation of silence and practice of sheela (abstain from killing, stealing, sexual activity, speaking falsely, and intoxicants) which is for calming the mind. Participants practice aanapaana, a concentration technique in which one learns to focus attention on one's breath as it enters and leaves the nostrils. The practice of Vipassana itself is about observing sensations throughout the body without the interference of thoughts, understanding their nature, and developing equanimity by learning not to react to them. Finally, meditators are taught loving kindness (metta) or goodwill towards all. The course also includes listening to lectures by S. N. Goenka. Vipassana is taught free of cost all over the world and is run by donations from practitioners who are urged to give with the feeling 'that another person may benefit from the technique.' One of the participating inmates, Rick Smith, says "Vipassana was the hardest thing I have ever done." The Vipassana routine is probably stricter than prison schedule, says Vipassana teacher Jonathan Crowley. Relaxation is the long term goal of the course, but the 10 day course involves very hard work. Dhamma in Pali or "Natural law" is the aim of a Vipassana practitioner. True to that aim, Rick Smith says in a letter to the Vipassana teachers that "Vipassana doesn't attempt to make life anything other than 'what is'. It doesn't teach me what the universe is; it shows me 'how it works'." The film does not present a good introduction to Vipassana; it introduces Vipassana only through the experiences of the practitioners, teachers and administrators. But I suppose this lack can be ignored given the complexity involved in representing an experiential knowledge-tradition. For more details on the Vipassana technique visiting their website dhamma.org would be useful. The stories of the four prisoners worked well in invoking reflection in the viewer. Most of them were charged with crimes of first degree murder and gang-related violence and were serving sentences of between 16 and 30 years in prison. The film prompts us to ask if the prisoners deserve another chance and short clip responses from the Alabaman public are varied. When an inmate invokes the African American psycho-social experience, we hear the complicated story of how one ends up taking to a life of crime. Other interesting perspectives question the 'punitive' model that prisons often represent, instead of a 'rehabilitative' one. Positive responses to Vipassana from both prison administrators and inmates were note-worthy. What Vipassana helped achieve, according to an administrator at the W.E. Donaldson Correctional, was the understanding that "sensations are driving your behavior'". As one inmate practitioner put it, Vipassana "gives a choice. I can now choose how to react to things..." Another inmate felt very pained that he couldn't share Vipassana with many more inmates, while another said he had started laughing at the way he was relating to things, "The old habit pattern is to react to sensations...but Vipassana asks us to observe." The film provides crucial clarifications while introducing Vipassana: that it is a non-sectarian, non-dogmatic practice that does not require faith in any religion or in Buddhism. Vipassana is purely experiential. Its experientialism is similar to Indian and other Asian traditions. Historically, it was the European/Western framework that 'saw' religion in every culture. (For an argument on this, see S.N. Balagangadhara The Heathen in his Blindness (1994) . Further, one realizes that it is not only that the European framework saw 'religion' in all cultures; it also classified phenomena into different religions. Thus even Social Science scholarship today sees the differences between Hinduism and Buddhism as differences that are of the kind between two separate religions. In truth, the dictum in the Gita, "Atmani... pashyanti atmanam"  (The Self sees the Self, in The Bhagavad Gita, 13: 24) comes true in Vipassana. Criticisms of Vipassana, as either scientific or unscientific, are actually based on the assumption that it is a religion, and rely solely on the western critique of religion. These criticisms fail to see what the prisoners of Alabama saw. The Dhamma Brothers also includes four short films on "Meditation and the Brain", "The Legal System", "Practicing Vipassana" and "Reflections from the Dhamma Brothers." It would be useful for students in psychology, sociology, law, cognitive science, Eastern philosophy and related disciplines. Jenny Phillips has compiled diary entries and letters received from the prisoners over four years into a book: Letters from the Dhamma Brothers: Freedom behind Bars in an Alabama Prison. To read a small sample of these letters, visit the film's websitedhammabrothers.com. Balagangadhara, S.N. 1994 'The Heathen in his Blindness...' Asia, the West and the Dynamic of Religion. Leiden, New York, Koln: E J Brill. Full verse is as follows: "dhyAnena Atmani pashyanti kechit AtmAnam AtmanA. anye sAnkhyena yogena karmayogena cha apare" (13:24) ("By meditation some behold the Self in the self by the self, others by Yoga of knowledge and yet others by karma yoga.") In The Bhagavad Gita. 1965. Commentary by Swami Chidbhavananda. Madras: Tapovana Publishing House. Kannan, Sushumna. 2009 Review of The Dhamma Brothers. Anthropology Review Database. April 02. Electronic document, http://wings.buffalo.edu/ARD/cgi/showme.cgi?keycode=3312, accessed April 8, 2009. Moyers, Bill, 1994, A World of Ideas: Conquering America. The Moyers Collection series. Princeton, New Jersey: Films for the Humanities and Sciences. Keywords: Culture, Asia, America, Literature, Immigrant experience, Race, Multiculturalism. ABSTRACT: Bill Moyers interviews the Indian-born writer Bharati Mukherjee about the immigrant experience in America in the 1960s and '70s. Mukherjee relates she would rather "conquer" America by contributing to the shaping of its culture and correcting its problems, rather than "adjust" to it. We learn how the 'American dream' survives for Asian immigrants despite the country's failed economic promise. Bharati Mukherjee was born into an upper middle class Indian family in 1940, and migrated to America in 1961 where she attended the University of Iowa and later met her husband Clark Blaze. In the film, Mukherjee recalls, how, upon arrival, she immediately felt 'at home' in America, and that she had left behind the safety and circumscribed life in India, only to face the constant challenges that life in America posed. Unlike most countries or cultures where coinages such as the 'immigrant problem' and 'multiculturalism' are posed as socio-economic problems needing the intervention of the State, in this film, America emerges as a far more fluid space, at least in the 1960s. The film offers a very different perspective on issues of culture through Mukherjee's personal experiences and insights. She asserts that, historically, America offered a space where immigrants like herself could become active in shaping its culture. For her, America represented the capacity to dream, and dream big. Mukherjee's understanding is that immigrants make America their own, despite the struggles they are faced with and the sacrifices they have to make. She sees America as "a stage for transformation" wherein the "immigrant changes the expectations of the white American," making him/her more open to the creation of a new culture. She tells us that she accepted the American challenge of "coming up from the bottom," and enjoys the challenge to the immigrant soul ''at risk," with no comfortable stereotypes available to lean upon. However, the lack of stereotypes "affects both whites and people of color", allowing for new cultural possibilities. She insists that this new possibility is not just about mimicry, or the "19th century pressure to make [one's self] in the Anglo-Saxon way", but that it is about "creating American culture daily through the improvised lives lived." In America, says Mukherjee, "merit counts, at least theoretically". Although she sees this in sharp contrast to the constraints of the caste-class Indian society she left behind, she is also aware of the cost to original identities in new places where "we murder ourselves" and "commit violence against our old selves". Mukherjee recalls that as a writer, she found no 'language' that could accommodate Asian experiences in American English fiction. She tells us of her disappointment with the New Yorker and Atlantic which "represented the neat lives of the whites, while the lives of the immigrants were messy" and "larger than real." In her own writing, she reveals that her attempts have been different and that she has sought to represent the lives of the immigrants. Talking of her other early experiences in America, Mukherjee says that she has not personally experienced any racial discrimination in America but found it institutionalized in Canada in the mid-sixties. In Canada, she says, although immigrants were encouraged to retain "old world psyches" based upon a mosaic theory of culture, it only resulted in the marginalization of South Asians; the immigrants that did well for themselves were targets of scape-goating. Thus a comparative perspective is offered on historically different approaches cultural issues that is possibly very relevant for current discussion. Bill Moyers asks Mukherjee that although she denies experiences of racial discrimination in America, why is it that the characters in her novels reveal otherwise. Mukherjee answers by saying that she differentiates the fictional world she creates from the real one, asserting at the same time that her characters face racism because of the "potential evil" in all of us. She says that Jasmine reinvents the idea of America as it attempts to capture the psychological dislocations, sacrifices and prices paid by the novel's main protagonist - a female illegal immigrant who becomes a murderer and blackmailer. Perhaps the real issue here is not so much about the relationship between life and literature and but that of actual social and cultural differences that then manifest themselves as psychological dislocations. Mukherjee in her reply to a different question by Moyers takes up the issue of cultural differences. The question asks how is it that the main protagonist in the novel (also called Jasmine) was fighting evil if she herself was a murderer and blackmailer? Mukherje replies that "it doesn't always have to be a Judeo-Christian morality" -- her characters follow their own morality, retaining their integrity as individuals. She says that she and her characters are actually fighting evil. While admitting that her characters are Conradian  in nature, she insists that her work however, was a "Heart of Light!" and not a "Heart of Darkness"; it said "the wonder, the wonder!" rather than "the horror, the horror!" Mukherjee's uniqueness indeed lies in her "embracing", and "conquering", as she puts it, of America. She does "not want to be just an expatriate, but wants to conquer and possess; to stay and fight the battles and correct the problems, rather than 'adjusting'". The film suggests that culturality and the freedom to make cultures together, is a significant part of what the 'American dream' is actually about, and not just about economic promises. Mukherjee mentions the violence perpetrated against Native Americans by the colonists, but fails to mention the violence of colonialism in India. Not mentioning the history of colonialism in India, but seeing it as a restrictive society and as a place where there was no "freedom from fate" constitutes a somewhat lopsided view. Overall, Conquering America is a very good record of the experiences of the early Asian immigrants in America and introduces many key issues in a short duration. In particular, it captures Mukherjee's experience of America and her valuable insights into issues in multiculturality. Students of Literature, Anthropology, Cultural Studies, Sociology, Asian Studies and American History would find the film useful and interesting. The reference is to Joseph Conrad's novel The Heart of Darkness.